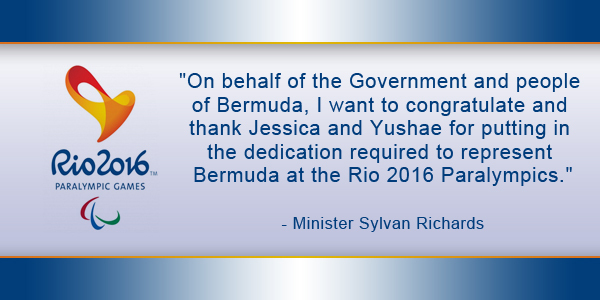 As Bermuda’s two paralympians Jessica Lewis and Yushae Desilva-Andrade prepare to leave for the Rio 2016 Paralympics, the Minister of Social Development and Sports Sylvan Richards wished them luck in their respective competitions. Bermuda will be represented in two sports this year – athletics and Boccia. Jessica is a T53 Wheelchair Track athlete and was the island’s sole delegate at the London 2012 Paralympic Games. Yushae, meanwhile, will be competing in Boccia in the BC2 Category. “Jessica’s talent has taken her to competitions all around the world; she has featured in international magazines and is an inspiration to everyone she meets,” said the Minister. Ann Lindroth, President of the Bermuda Paralympic Association said: “I am so proud to see both Jessica and Yushae participate in the Paralympics this year. The Bermuda Paralympic Association [BPARAS] is the National Paralympic Committee representing Bermuda on the International Paralympic Committee [IPC]. The aim of the BPARAS is to encourage all differently abled persons to participate in sports and reach their full potential in their chosen field of sport. The Rio 2016 Paralympic Games takes place from September 7-18, 2016 and will see 4000 athletes from 176 countries compete in 23 Sports.